During Diwali people decorate their house with rangoli. There are wide variety of designs of rangoli available. Womens put all their efforts in decorating rangoli with designs and patterns. 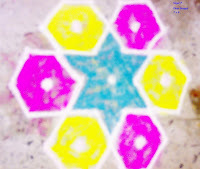 with the help of rangoli pictures, images and photos in newspaper etc.